Happy 93rd Birthday, Madiba. Today is Mandela Day, in honor of the birthday of Nelson Mandela, often called Madiba, an honorific, his clan name. Mandela needs no introduction to our readers. As a lawyer he led an exemplary life, 27 years of which he spent in prison for his principled political activism for the causes of freedom and justice for all in his homeland of South Africa. Many have read his autobiography, Long Walk to Freedom, with its introduction by former Secretary General of the United Nations, Kofi Annan. I've been reading Mandela's recent publication of Conversations With Myself, a collection of the writings of Nelson Mandela, many of which were written while imprisoned. As he says, in prison you've got time to think. This year on 18 July - Nelson Mandela’s 93rd birthday - the UN is joining a call by the Nelson Mandela Foundation to devote 67 minutes of our time to helping others, as a way to mark Nelson Mandela International Day. Here on Blawg Review, we've covered topics and issues that were of great interest to Nelson Mandela, the lawyer, and the man. Notably, Omar Ha-Redeye hosted Blawg Review #278, which was recognized at the Blawg Review of the Year 2010, to mark the International Day for the Remembrance of the Slave Trade and its Abolition. Earlier in 2010, on Slaw.ca, Omar Ha-Redeye hosted Blawg Review #249 on National Freedom Day. The Nelson Mandela Foundation seeks to contribute to a just society by promoting the vision and work of its Founder and convening dialogue around critical social issues with The Dialogue Programme. Mandela would have been a heck of a law blogger! The Innocence Project Blog reports that New York exoneree Dewey Bozella received the Arthur Ashe Courage Award at the ESPY Awards. Bozella served 26 years in New York prisons for a murder he didn’t commit before he was exonerated in 2009. Nelson Mandela, was a previous recipient of this award. The country is a signatory to the 2000 UN protocol to prevent, suppress and punish trafficking in persons. In signing this document, also known as the Palermo Protocol, the government committed to adopting legislation to make human trafficking a criminal offence and began the process of drafting a law in 2003. However, the Prevention and Combating in Trafficking in Persons (TIP) Bill only reached parliament in March 2010 and there is no indication of when it will be passed. Mike Spindell, Guest Blogger on Jonathan Turley's blog, hopes that this somehow works out well for establishing an Egyptian Democracy, rule of law and freedom. Glenn Greenwald reports how the U.S. government uses its media servants to attack real journalism. 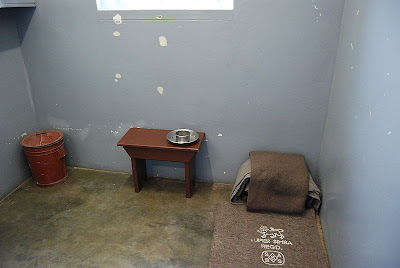 Mandela might have thoughts on this study, blogged by Doug Berman on Sentencing Law and Policy, that finds "black men live longer in prison than out". Scott Greenfield asks, "How many millions of fliers, of citizens, of people, must have their personal privacy and physical integrity sacrificed in the off-chance that the TSA might, eventually, stop a terrorist?" Mark Bennett, on Defending People, tweaks the TSA. Dan Hull at "What About Paris?" on Bastille Day. In an interview with Elisabeth Braw for Huffington Post, Desmond Tutu says young South Africans don't know what Mandela did for us.